Coming up with the perfect weight loss diet plan can be a challenge – especially when you LOVE food. Let’s face it – there aren’t many of us who would leap for joy at the idea of losing weight by eating a bunch of bland, unexciting food. Thankfully, though, you don’t HAVE to sacrifice your taste buds in order to achieve your weight loss goals. You also don’t have to starve yourself. So, what’s a girl gotta do to create a diet food plan that will satisfy her taste buds, her belly, and her sense of accomplishment? You might have heard the saying “a goal without a plan is just a hope.” Although it sounds a bit cliche, it’s actually true! When it comes to reaching a goal (whether it’s losing 50 pounds, starting a business, or getting married), your best shot of achieving that goal is having a solid, actionable plan in place. When it comes to losing weight, you should set aside time to create a diet food plan (I like to call it a meal plan). Meal planning can be really simple! Come up with a list of healthy meals and snacks that you enjoy, plug them into your calendar, and you’re good to go! You don’t even have to do it frequently if you don’t want to. Something to help those who are new to meal planning is to come up with one week’s worth of meals and snacks and then repeat it throughout the month. Then, as you become more comfortable with the routine, start adding in more recipe ideas. Before you know it, you will have a constant supply of meal plans that you can choose from. The main thing, though, is to FOLLOW your meal plan. After all, a plan isn’t worth much at all if you don’t put it into action! Have you ever been so busy working or doing your mommy thing that you get to dinnertime before you realize that even though you fed the kids, you haven’t eaten anything more than maybe a piece of toast for breakfast? Then, as though you have to make up for lost time, you end up eating ALL THE THINGS. That’s because when we feel that type of intense hunger, it is MUCH more likely that we will overeat. That’s with anything, really. When you deprive yourself of something for an extended period of time (even accidentally) – ESPECIALLY if it is something you need or enjoy – when you finally get it again, it’s like you just can’t help but to overindulge. Avoid the urge to skip snacks, too! 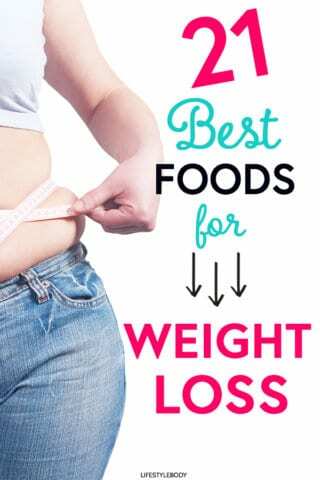 It can slow down your metabolism, making it difficult to shed pounds. The quickest way to become frustrated with your weight loss goals is when they are unrealistic to begin with. Although it would be absolutely lovely to be able to lose 20 pounds each month, it’s not only unlikely to happen – it’s also not healthy. Embrace the fact that you didn’t gain this weight overnight, so you’re not going to lose it overnight either. A good rule of thumb for weight loss is to lose 1-2 pounds per week. So if you lose 50 pounds in a year, you did good, my friend! Another thing you have to be realistic about is your diet food plan. If the list of foods you will eat is filled with food you don’t like (and devoid of all the foods you enjoy), what’s the likelihood that you’re going to stick to it for long enough to reach your weight loss goals? If you’re like most of us – not likely at all! Instead, choose foods that are diet-friendly, but that won’t make you feel like a 4-year-old who is being forced to clear her plate before she can have dessert. Losing weight (and keeping it off) is not just about WHAT you eat. It’s about HOW you eat. Be mindful about your food – from deciding what you will be using to nourish your body to taking time to savor and properly chew every bite. Not only will this make you more intentional about what you eat – eating more slowly can also help you to avoid overeating. Often, when we eat quickly, we end up feeling stuffed. Though we may believe that feeling stuffed is merely the sign of a good meal, it is actually a sign of overeating. The goal of eating is not to feel stuffed. It’s to feel satisfied. But, sometimes it takes a while for your brains to realize that our stomachs have had enough. Eating more slowly gives you more time to recognize that feeling BEFORE you’ve eaten too much. When we’re so focused on losing weight, it’s easy to get roped into the habit of weighing yourself all the time. While it’s good to keep track of your progress, weighing yourself so often can actually be discouraging – especially if the scale isn’t showing as much progress as you would like. When that happens, it can become very discouraging very quickly. Rather than weighing yourself often, try to keep it limited to weekly weigh-ins. Maybe even monthly! After all, your weight will likely fluctuate throughout a single week. 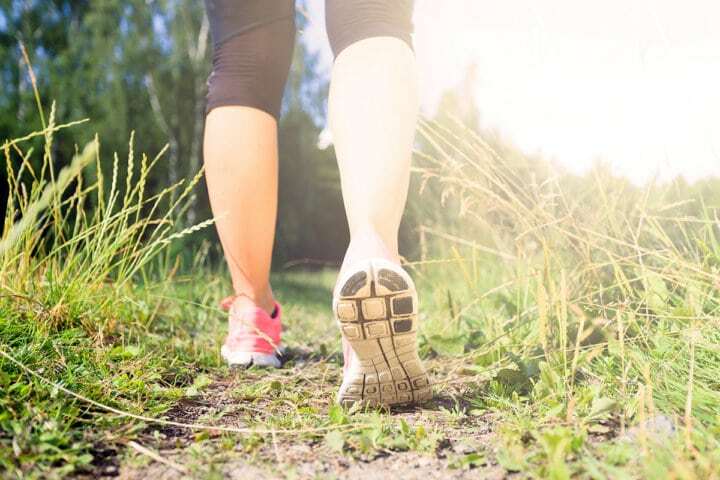 You should also pay attention to other signs of wellness progress, such as having more energy, having a clearer mind, and your clothes fitting differently. Remember, not all progress will show on the scale! Last, but not least – talk to your primary care physician about your weight loss goals and progress. Your doctor may be able to provide you with helpful tips on how to lose weight that take into account a variety of factors, such as age, weight, and fitness level. You may also learn whether or not an underlying medical condition is preventing you from losing weight. I have a friend who was struggling for over a decade to lose weight, only to discover that she had a thyroid condition that makes it difficult to lose weight and keep it off. Once she had that treated, she was able to see progress. So, if it’s been a while since you’ve seen your doctor, make an appointment now! Now you’re probably wondering “Ok, those are good tips. But what can I eat?” Below, you will find a list of diet-friendly foods to add to your grocery shopping list. Not only are sweet potatoes versatile (just ask Jenné Claiborne, the vegan chef behind Sweet Potato Soul – the Youtube channel and the book) and delicious – they’re also good for you! First of all, they are high in fiber, which means they can fill you up quickly and keep you satisfied for longer. Sweet potatoes are also a low calories food, which definitely helps when it comes to losing weight. A great meal that’s filling and hearty (and even the kids will enjoy) is sweet potato chili! What’s not to love about soup? It’s usually easy to make – just dump a bunch of ingredients you love into a pot, add water or broth, season it to taste, cook, and enjoy! You can make it light and refreshing. Or go for hearty and filling. Soup, especially, clear or broth-based ones can be a low-calorie way to fill up! Go for soups that are high in protein or fiber by adding in veggies, beans, and/or lean protein. Check out this delicious rich and mushroom soup! Quinoa (pronounced keen-wah, in case you were wondering) is the superfood you should add to your grocery list! This high-protein, high-fiber grain is chock full of vitamins, minerals, antioxidants, and all 9 of the essential amino acids. It pairs perfectly with meats and veggies, You can also eat it all throughout the day, for breakfast, lunch, and dinner! Two other whole grains that you can eat are oats and brown rice. Pumpkin is more than just an ingredient in Starbucks’ most popular autumnal beverage. It’s also a natural appetite suppressant that has a good amount of fiber and protein to boot. There are a surprising number of healthy pumpkin recipes to add to your menu. And don’t forget that roasted pumpkin seeds are a great, healthy snack! Here’s a Vegan Pumpkin Mac n’ Cheese recipe that’s super healthy! While lemon does not have any fat-melting properties, it does contain pectin fiber, which fights cravings and helps you feel fuller. Lemon juice can also be used to add flavor to your diet. For example, instead of guzzling down your favorite soda, squeeze a bit of lemon into your water instead. Not only will it give you a dose of vitamin C, it might also give your bowels a much-needed boost. It’s also great when added to green tea. On top of adding some zing to your beverages, you can also use lemon to add a citrusy flavor to roasted veggies, like asparagus. And if you’re looking for a healthy, yet tasty salad dressing, try mixing together lemon juice, thyme, olive oil, and salt and pepper to taste. Here’s a lemon baked salmon recipe for ya! Want to lose weight, but don’t want to cut steak from your diet? You can eat red meat as part of your diet – just make sure you’re opting for lean cuts. This includes sirloin tip side steak, top round steak, eye of round steak, bottom round steak, and filet mignon! Want to make sure they come out juicy (despite the lack of fat)? Marinate them in an olive oil/lemon juice or olive oil/vinegar blend, along with your favorite seasonings. Here’s a Flank Steak Stir Fry recipe! Love chicken? You don’t have to avoid it either! As with your beef selection, just focus on a specific cut. When it comes to weight loss, your best bet is chicken breast. It’s lower in fat and packed with protein. To make it healthier, opt for skinless chicken breast. Here are 60 chicken breast recipes! When it comes to fish, salmon is the healthiest option out of the bunch. Low-calorie and high in protein, salmon is an excellent source of vitamins B and C as well as potassium, selenium, and phosphorous. Seafood in general also contains iodine, which is essential to thyroid health and, in turn, your metabolism. Naturally fatty, you don’t need to add a lot of oil to add flavor to salmon. Simply brush on a tiny bit of olive oil to both sides and flavor with things like salt, pepper, orange juice, ginger, honey, or your favorite herb mix. Then, enjoy it in a variety of healthy salmon recipes. Here’s a Honey-Miso Glazed Salmon dinner recipe to keep you full for hours! Tuna is another low-calorie, high-protein fish that is very diet-friendly. Eat it with crackers, on bread, in a salad, or in a variety of different ways. One tip, though – if you’re eating canned tuna, opt for the kind that is packed in water, not oil. Here’s a great Tuna bowl with chickpeas, lentils and baby peas! When it comes to leafy greens, kale and spinach are at the top of the pack when it comes to being nutritional powerhouses. Eat them in salad, as a side dish, or even in your favorite smoothie (I promise that if you do it right, it’s delicious!). Greens (especially collard), Swiss Chard, Arugula, and Romaine lettuce are also great option. The one with the least nutritional value? Iceberg lettuce. While it won’t add many calories to your diet (making it a good choice to eat if you’re counting calories), it doesn’t have any benefits that matter. So, keep that in mind when shopping for leafy greens on your next grocery shopping trip. Why not try a Strawberry and Spinach salad? Greek Yogurt is another food that is high in protein – thus helping you stay full longer. It’s also pretty versatile! Use it in place of sour cream on baked potatoes, chili, and in Mexican food. Substitute mayo for Greek yogurt on your favorite sandwiches and wraps. It’s great when added as a base for smoothies. Or you can just put some in a bowl and top it with fruit and granola! You can also use it in a variety of dips, creams, spreads, and toppings. Get creative! Here’s how to make greek yogurt veggie dip! If you’re looking for a way to incorporate more dairy into your diet, cottage cheese is another high-protein, low-fat, low carb option to consider. It’s great when paired with fresh fruit. Though they might look unimpressive, chia seeds are full of essential nutrients like omega-3’s, potassium, and calcium. They’re also a good source of protein and fiber (with 3 and 5 grams per tablespoon, respectively). Because they are nearly flavorless, they can be used to add nutritional value to savory AND sweet dishes, making it pretty darn useful! You can shake them into smoothies, yogurts, and puddings. You can even mix them with water to make an egg substitute for vegan dishes. Here’s a Blueberry Chia Pudding recipe that’s super simple to make! While it’s not the magical fat-burning fruit people may have you to believe, grapefruit IS low-calorie and has enough fiber to help keep you from over-indulging. It’s also, not surprisingly, a great source of vitamin C, so it’s nutritious as well! Here’s a Spicy Shrimp and Citrus Salad! Ok, so I can’t be the only one who randomly sings the “Incredible, edible eggs” jingle sometimes when I’m whipping up an omelette. I don’t care what anyone says – that jingle was a brilliant piece of marketing, lol! It also helped to showcase a food that wasn’t always given its due. Eggs are high in protein, so they make a great snack item in between meals. They’re low calorie (only 78 calories per large egg), so even if you eat several, you’re not adding to your calorie count by much). Choline, which is found in egg yolk, helps to aid metabolism, so don’t feel obligated to eat just the egg whites! And, they’re cheap, so they’re a highly affordable item to add to your diet food plan. Here are some healthy baked egg muffins! We all know the saying “Beans beans, they’re good for your heart. The more you eat them, the more you –” Yeah, you know the one. What you may NOT know is that in addition to being heart-healthy (yay for lower cholesterol! ), the soluble fiber content in beans and lentils helps you feel full longer. They’re also good sources of protein. Plus, they’re super versatile – you can even use them in dessert! Hello, black bean brownies! Avocado is more than just an ingredient in 2018’s most trendy, Instagram-worthy dish. It’s also really good for you! Loaded with vitamins (A, B, C, E, and K) and minerals, avocado is a nutrient-dense option. High in monounsaturated oleic fatty acids (the good fat! ), avocado (and avocado oil) helps your body use fat for fuel. It is also an excellent and tasty replacement for butter and fatty oils. And, if you love guacamole, take to heart the fact that adding two tablespoons of it to eggs, salads, or meat can help you stay full longer. Bonus! Try this Guacamole Stuffed Sweet Potato recipe! Love almonds? Go ahead and enjoy them! High in protein, they help to stave off hunger. Also, like avocado, they’re a good source of healthy fat. Eating a handful (or, more specifically, ¼ of a cup) of roasted almonds per day as snacks can be a great way to help your weight loss efforts by keeping you feeling full between meals and maybe even helping you eat LESS at mealtime. Turns out, they may also keep the extra pounds away! Apples (especially varieties like Granny Smith) contain things like fiber and polyphenols that help promote good gut health by feeding GOOD bacteria. This, overall, helps your digestive system to do its job better, thus aiding weight loss. One thing, though, this only helps if you eat RAW apples as cooking them destroys much of the nutritional value. So eat apples raw, add them to smoothies, or throw them in salads get to the best effect. Here’s an Apple Smoothie Recipe! Broccoli, cauliflower, cabbage, and Brussels sprouts are all cruciferous vegetables. They’re high in fiber and a good source of protein, making them very filling without a ton of calories. If eating these veggies doesn’t sound appetizing, I highly recommend trying Sweet Potato Soul’s recipe for Spicy Fried Cauliflower “Chicken”. “Doth mine eyes deceive me?” Nope! You read that right. Dark chocolate can help aid your weight loss efforts. At least the kind that is at least 70% cacao. With 11 grams of fiber in a 100 gram bar, it can be a great snack. 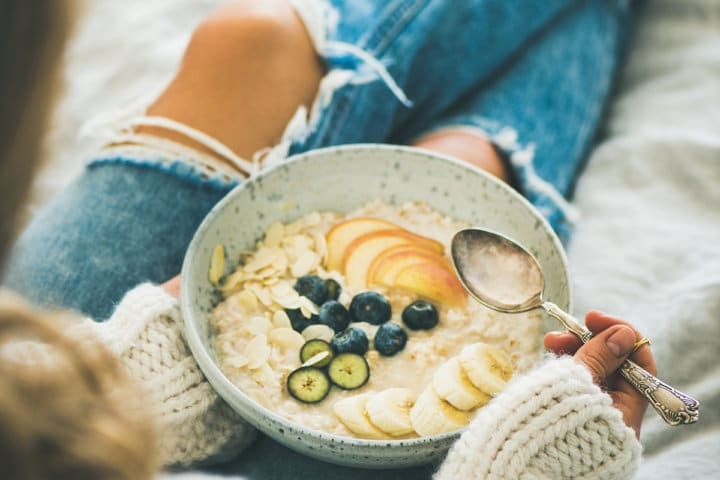 As you can see, there are plenty of tasty and nutritious foods that you can help you reach your weight loss goals –without feeling deprived or hungry all the time. I hope this gives you a bit of hope and helps you to create a meal plan that makes your weight loss journey more enjoyable. Eat these decadent dark chocolate strawberries at work or as a quick pick-me-up. To start losing weight, try to incorporate these healthy food choices in your meal plan and through out your day. And try not to throw around healthy eating excuses! None of that now! 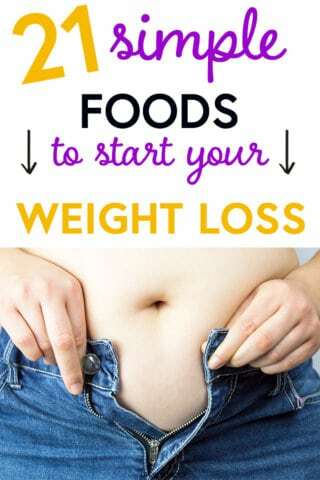 Do you have any other ideas for foods that can help with weight loss? I’d love to hear about what works for you in the comments below!